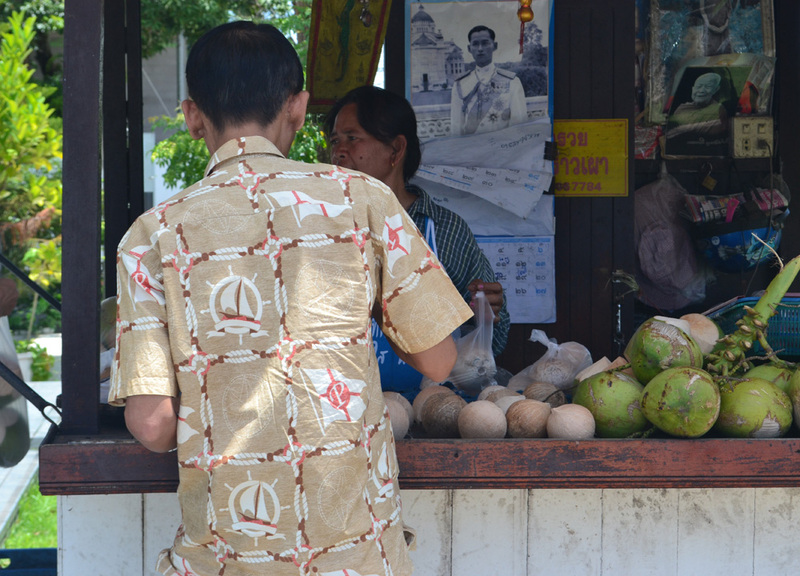 How to Open, Prepare and Eat Coconuts in Thailand? First off, I really should apologize for the lack of posts this year in rural Thailand. It’s now been over half a year living here and in this time I’ve posted zero posts on the region. The reason for this is, in the background I’ve been chronicling my life here for a book called a Potato in a Rice Field. It currently sits at around 60,000 words at the halfway point so there’s obviously a lot of editing to do. Anyway, this post is less about my new rural lifestyle, and more about information and as it is too boring to chronicle in the book I am sharing it here (yes, it’s wall-to-wall excitement here in rural Thailand). So today I was delegated to a new role in the house as the coconut wrangler, a self-declared title, because “khon bok maphrao”, which translates to “coconut opener”, just doesn’t sound cool enough. 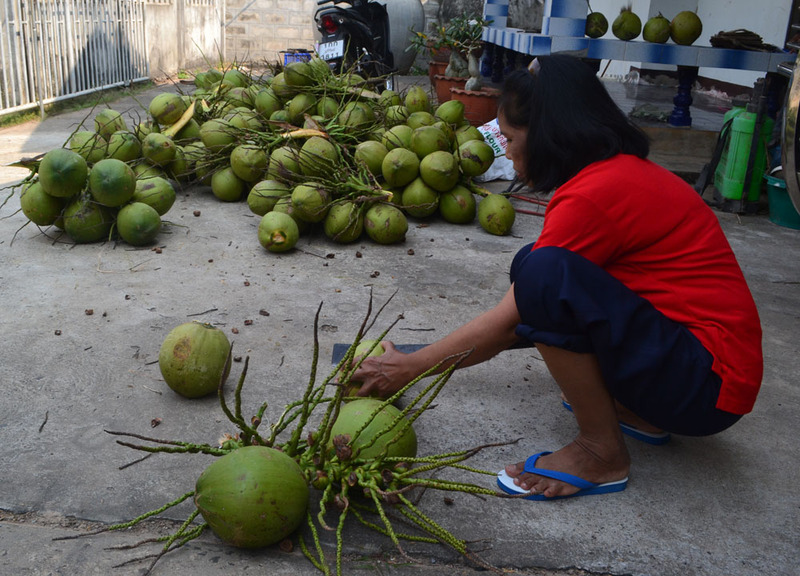 Throughout the day I managed to pry open up to 60 coconuts in preparation for a feast which will mark a significant Buddhist merit making ceremony in the coming week. After completing the 60 coconuts I was rewarded with two big bottles of beer. In all it’s been a good day. I dehusk the coconuts with the help of Meh! (mum) and granny Yai Thip, who are both nowhere near as good as I. This is to do with leverage, more than strength, where I am the only person large enough to pull apart the coconut husks. The others are almost hobbit-size in comparison. The gist of my job is to jab a metal prying tool into the husk of the coconut, then open it, to pull the shell apart. 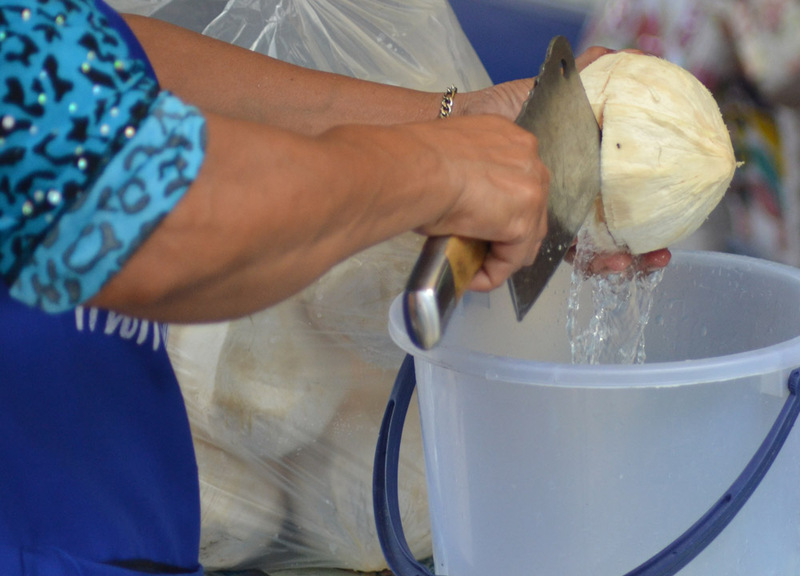 This typically takes three, maybe four, jabs covering all sides of the coconut before the husk comes fully loose. I then roll the loosened coconuts to Meh! and Yai Thip who complete the dehusking in the traditional way of hacking at them with sharpened coconut cleavers. 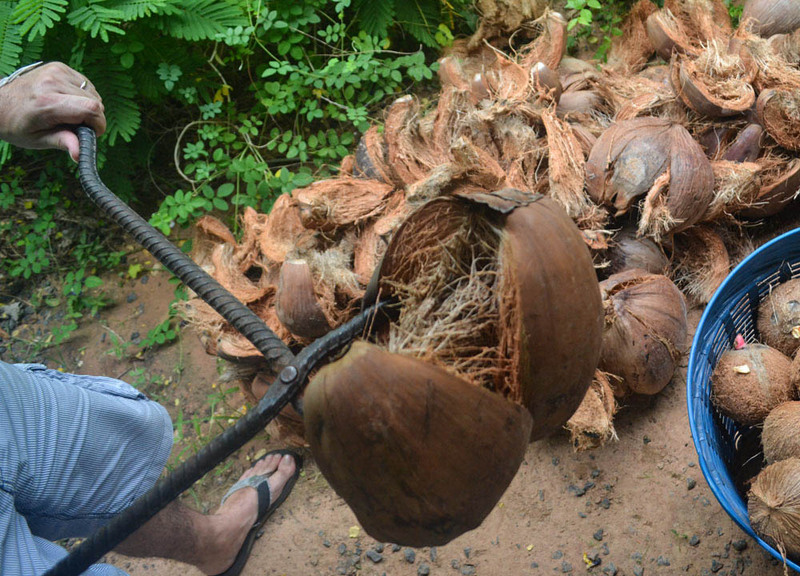 After dehusking the coconut is now roundish in shape, with a shell and hair-like husk strands. These coconuts are similar to those found balancing on poles at fetes or funfairs, or in the fruit shelves of your local Tescos. Despite what cartoons tell you, coconuts are never found like this in the tree. Once fully removed the husks are thrown to the side and piled up for later use where they often fire stoves for cooking, or are made into hanging plant pots. Brown coconuts, are little more than green coconuts, which have matured longer and more-than-not they have already fallen from the tree. 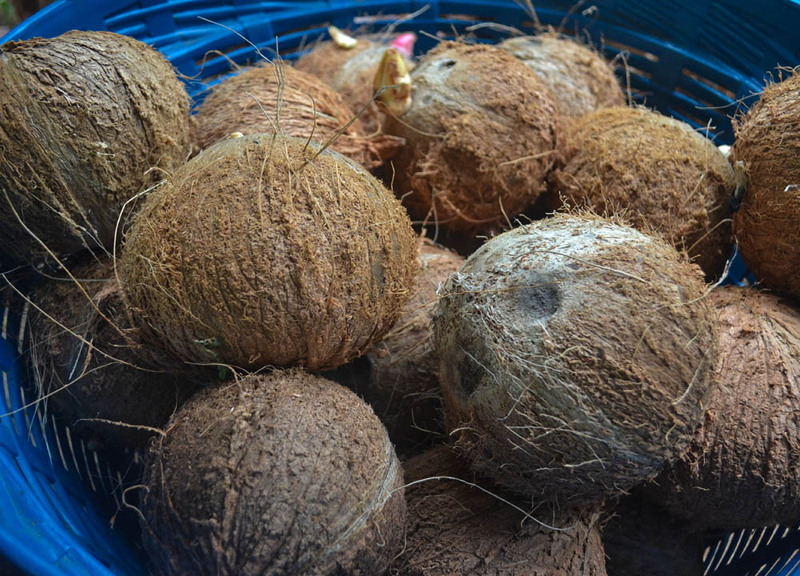 Many of these coconuts have probably been lying around for days, weeks, months even, but they are still good for consumption, although not for drinking. Once the shells are cracked open the coconut water inside will likely be ignored, and discarded to the ground. What we want is the fleshy pulp inside, which, in maturity, has become thick on the inner walls. 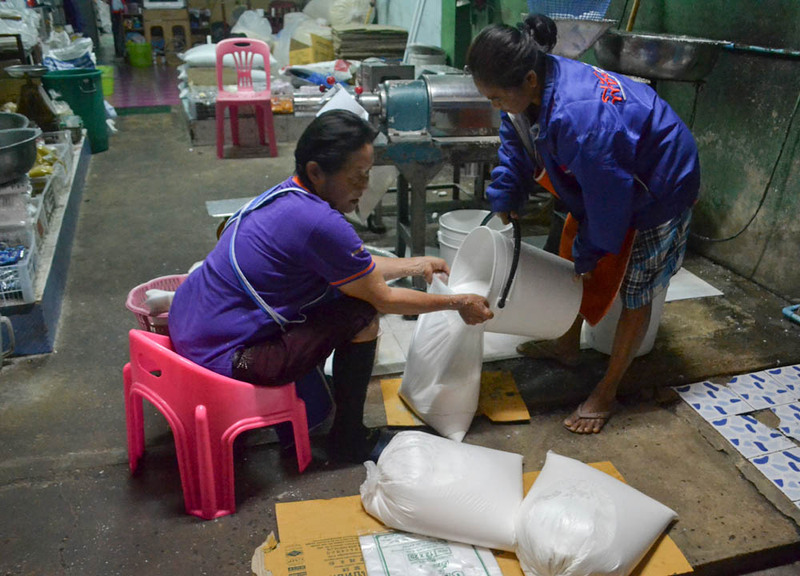 This pulp will be used to make coconut milk, a product more valuable, for so many reasons, than the water inside. 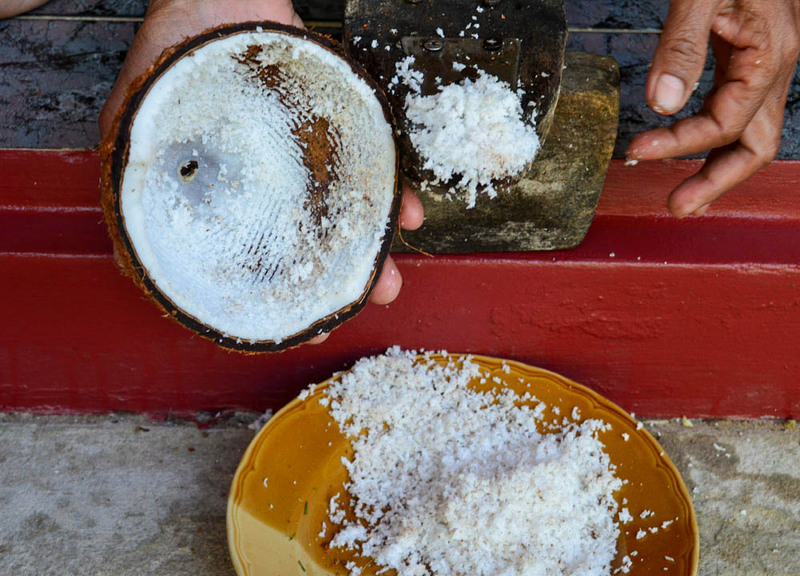 To make coconut milk we first grate the pulp using a small wooden stool with a metal grater attached to the front. 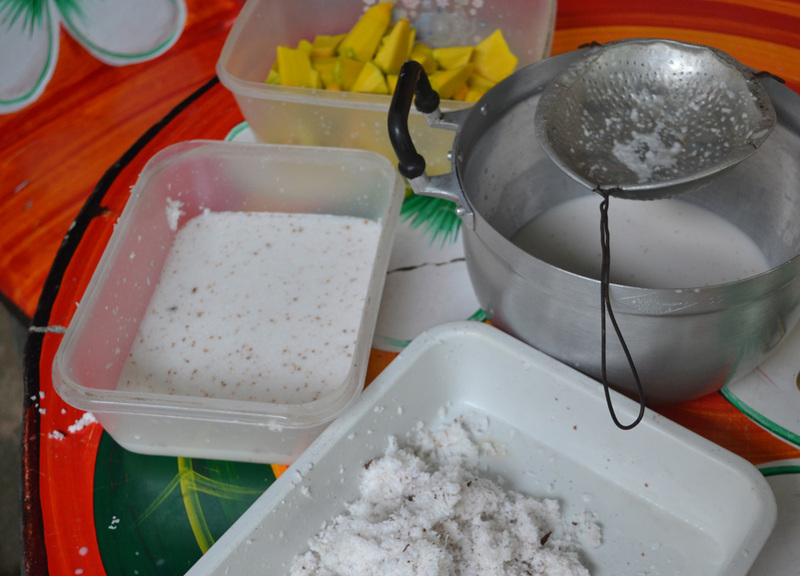 This is done using half coconuts, scraped back and forth, with the grated coconut pulp collected in a container below. The grated coconut will then be mixed with a small amount of hot water, and squeezed by hand through a sieve. 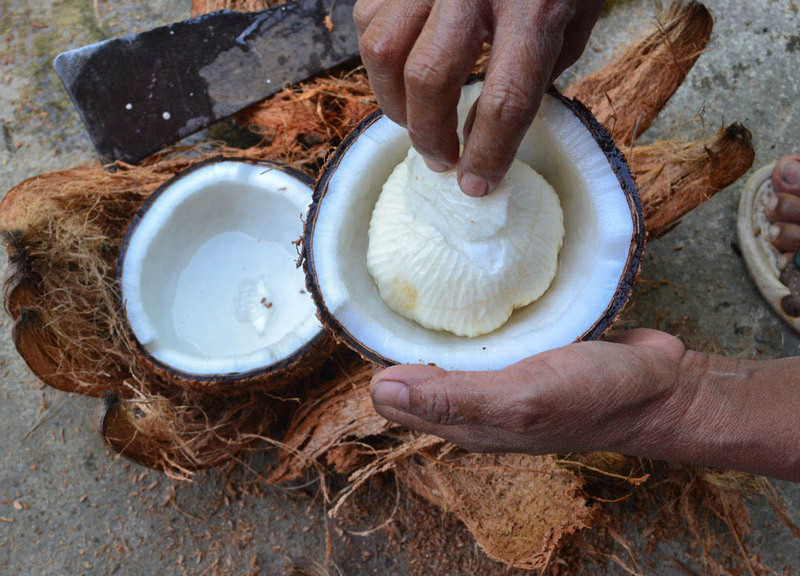 The first squeeze of the coconut is called ‘Hua Kati’ or ‘head of coconut milk’, which is rich in coconut oil, and always used first in cooking. The pulp then goes again for a second squeeze through the sieve and milk collected. This is now known as ‘Hang Kati’ or ‘tail of coconut milk’. The coconut milk can now be used in seemingly endless recipes of foods, desserts, and of commonly Thai curries. If coconut milk is left to settle, a thicker layer will separate and come to the top. This is known as “coconut cream” although we rarely wait around to find it. This is the traditional method for making coconut milk above, which is good for a curry or two, but when there’s 60 coconuts, and a village temple to feed, this method would take days. Instead we take a shortcut and drive into town at stupid o’clock (3am) the following morning to find a coconut processor. 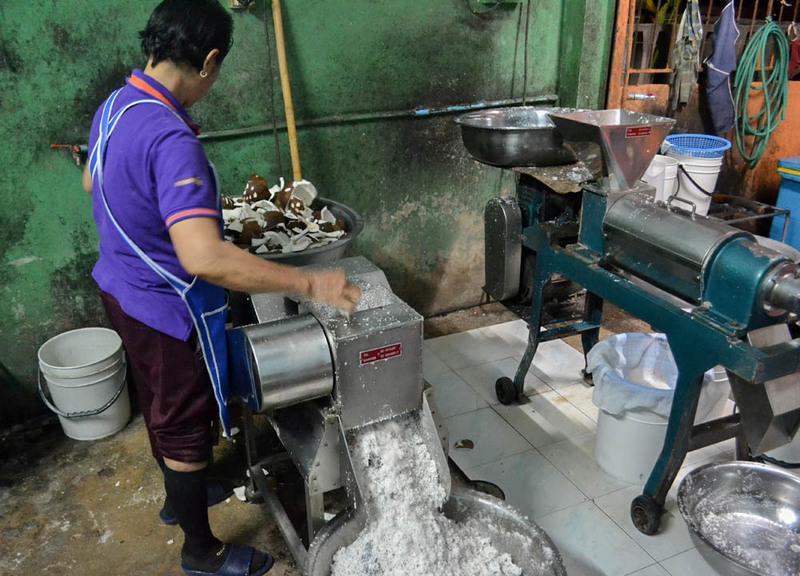 Here the coconuts are processed by machines, rather than hand, through similar two step processes. Before the do we remove the coconut pulp from the inside shells and hand them over. The coconut pulp is then thrown into a grating machine where it is grated and spat out the opposite end to be collected in a large container. 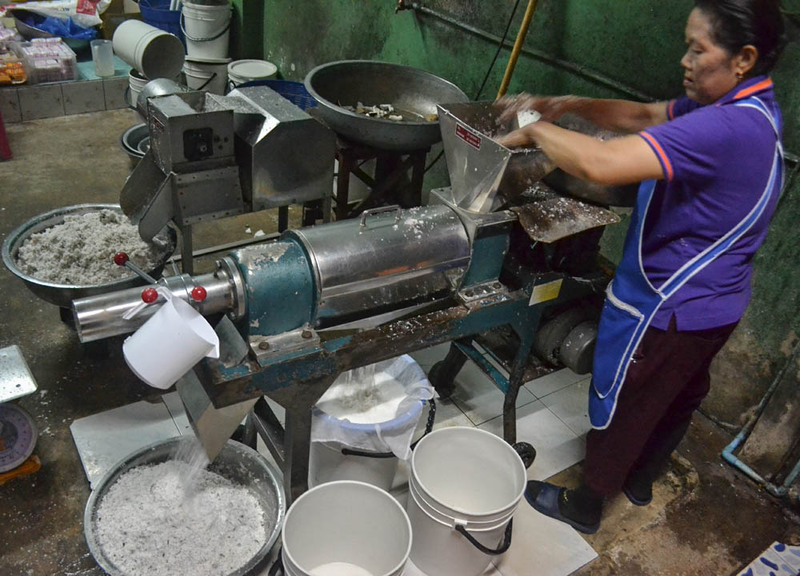 Next, the grated coconut goes to the squeezing machine, where it is mixed with water, and squeezed through the machine to be collected in buckets underneath. Again, the grated coconut pulp is spat out the opposite end and it goes for a second run. Both processes take roughly 30 mins and we leave with two big bags of ‘head’ and one of ‘tail’. It costs us around 4 quid. Green coconuts, or young coconuts as they are better known, are little more than brown coconuts, which have matured less. To collect them they are typically hacked down from the tree while still young, and before they have begun to change colour. These coconuts are the better known drinking coconut of Thailand often found at night markets, on tourist drink menus, or, hacked open as beverages on the southern island. 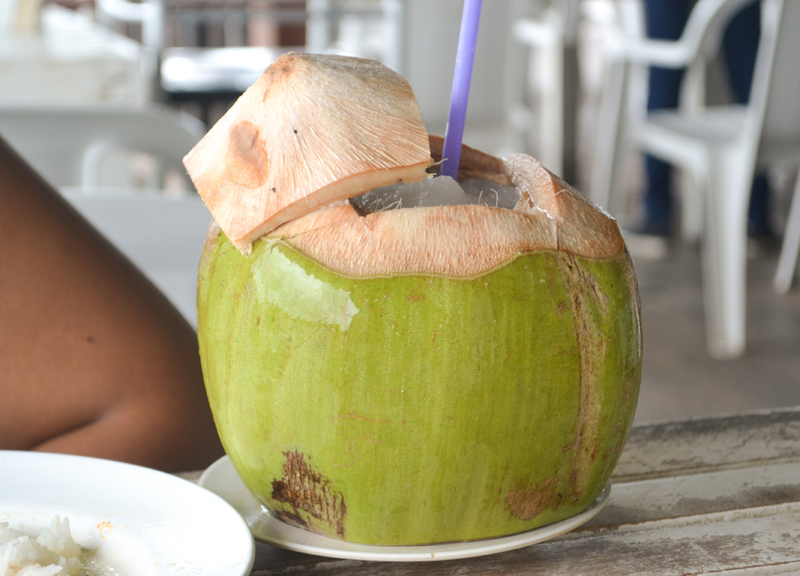 The liquid inside the coconut is known as ‘coconut water’, which shlooshes around when shaken. It is sweet, drinkable and delicious. To open a young coconut, just hack away at the top with a coconut cleaver, until a hole is made, then pop in a straw and enjoy. The green coconut inner flesh can also be eaten but it won’t yet have thickened, and they are relatively useless in making coconut milk. Roasted coconuts are little more than green coconuts which have been stripped to the shell, and cooked in flaming charcoals, for around 20 minutes. This results in a sweeter coconut water, and a loose and soft flesh which easily falls from the walls. 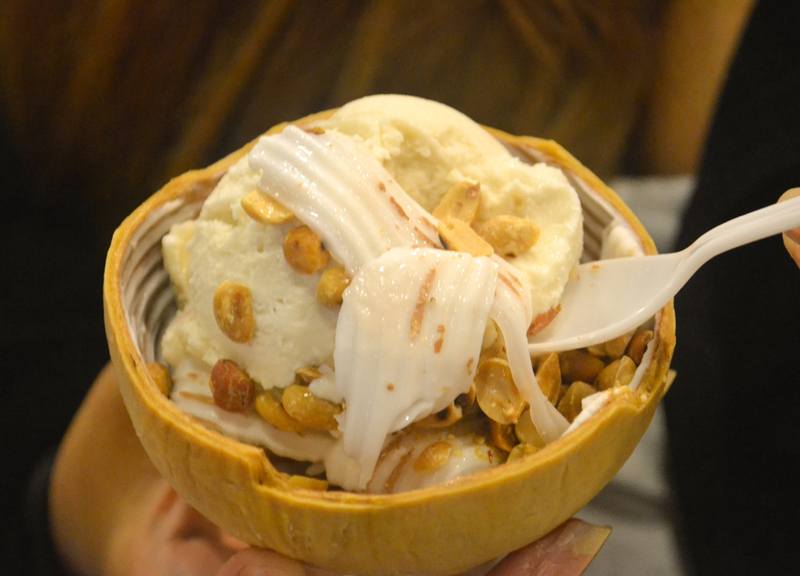 This makes the roasted coconut perfect for dessert where the loose flesh is commonly mixed and served in their half shells, with scoops of coconut ice-cream, and popular toppings of roast peanuts, sweetcorn, beans, jelly bit, and all sorts, and anything. To open and drink the coconut water of a roasted coconut just pierce through one of the three eyes with a knife, or similar, and pop in a straw. Roasted coconuts are often sold next to young, green coconuts, and are easy to tell apart with their brownish, white shell and occasional scorch marks. So these aren’t the most exciting of foods, but I’ll mention them anyway. If a coconut is left over time on the ground there is a good chance of it beginning to sprout into a new tree. 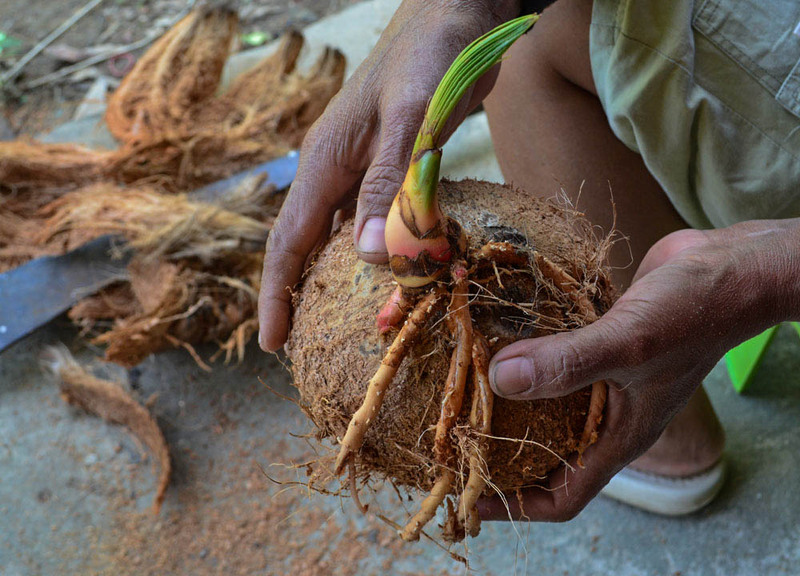 This sprout will grow from one of the ‘three eyes’ of the coconut shell and when it does, an unappetizing, round, sponge-like growth forms inside the coconut. It is edible but it isn’t much use otherwise. Some of these ‘jao’ balls are apparently sweet, juicy and delicious, but, from my own experience, they’ve all been tasteless and not worth biting into. The texture feels like cotton wool and its weird when they quickly disintegrate in your mouth. Therefore, they are typically lobbed into nearby bushes and ignored. Despite the sprout there will be little change to the inner flesh of the coconut and they can still be used to grate and squeeze for coconut milk. 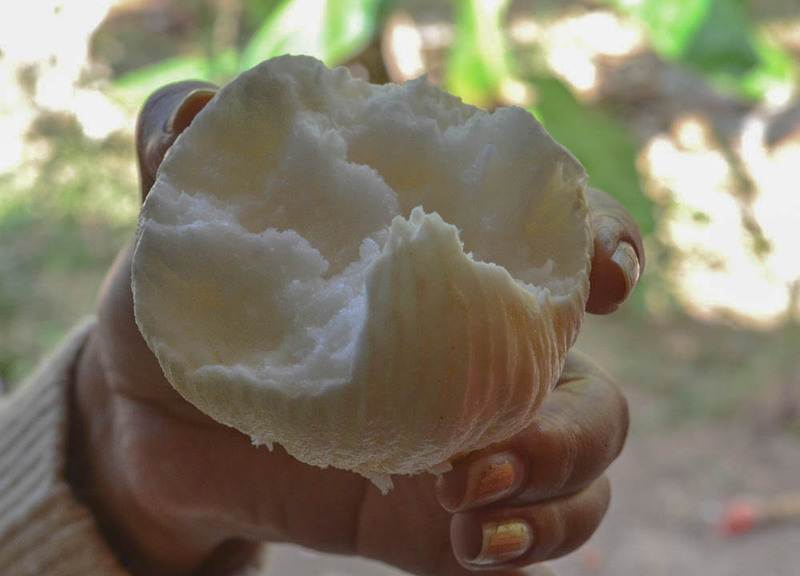 Palm wine has very little to do with my life here in rural Thailand (we drink rice wine here) but it is relevant to the coconut palm, and is is found throughout the region. Travelling in Asia I’ve sampled palm wines from lots of places; from coconut arrack cocktails in Sri Lanka, to tuba and lambanog in the Philippines. This example however, is for palm toddy in neighbouring Myanmar where I stumble onto palm farms when travelling just southeast of Bagan. This not-so-potent wine is sourced from the coconut tree, where instead of actual coconuts, the liquid is taken from the young coconut flowers of the tree. 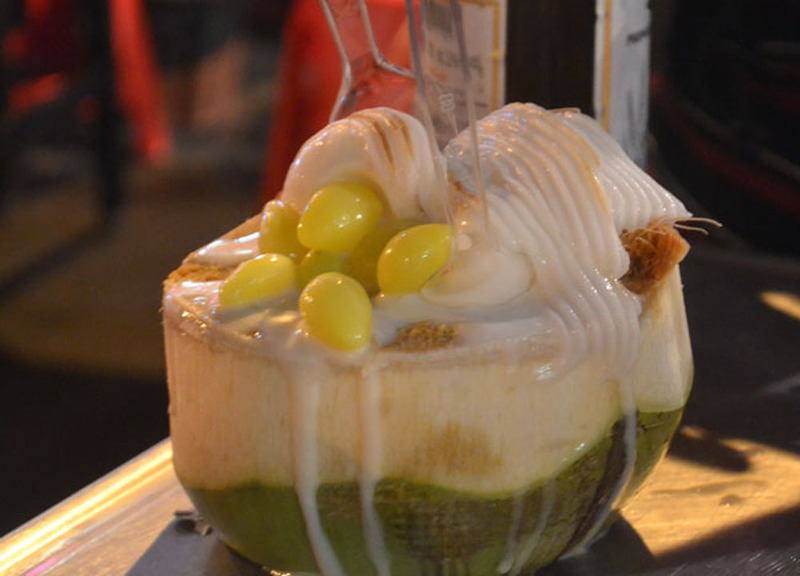 The palm sap, a sweet, white, non-alcoholic liquid, is collected from incisions in the young coconut flowers, before it is left to ferment in its own natural yeasts. The resulting liquor is a mildly alcoholic drink of around 4% alc. which I’d happily substitute for a beer. For the good stuff, palm wine then has to be distilled, often using flame heated, earthen stills, to produce a more potent ‘palm whisky’, a clear spirit which tastes a bit between whisky and rum, and has a greater alcohol content of up to 50% alc. 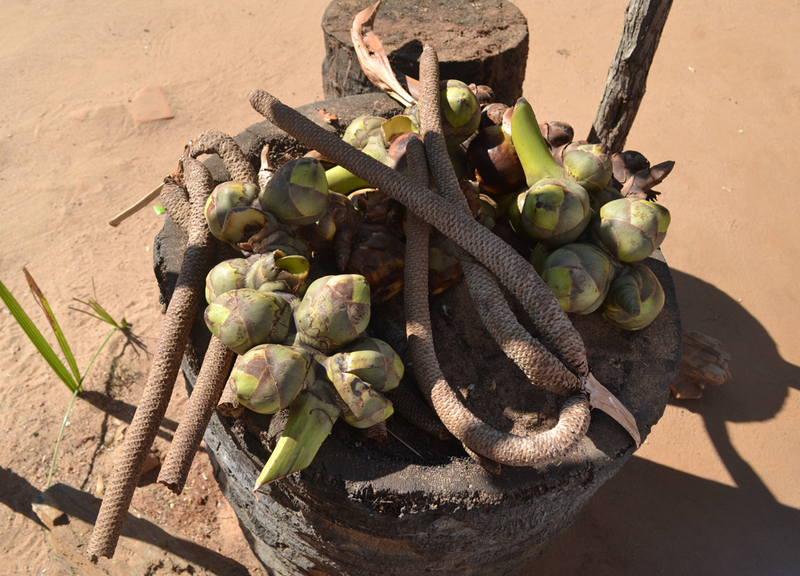 There are some lazier ways to collect palm sap wherein the tree itself can be tapped, or the flowers cut down and milled to squeeze out the liquids. Also sourced from young coconut flowers is palm sugar, a widely used ingredient in cooking from all over Asia. 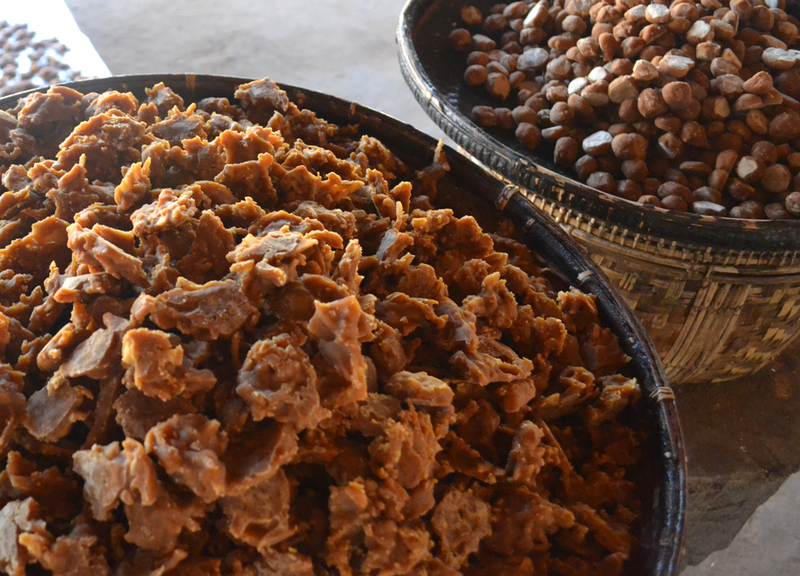 For palm sugar, before the natural fermentation process begins, the collected palm sap is put directly to heat over flames, using earthen vats. The liquids in the sap will evaporate to leave a thick syrupy goo which when left to harden becomes palm sugar. While typically found as a light creamy color, this does depend on what sap was used to create it. Palm sugars can be mixed with other ingredients such as peanuts, condensed milk and coconut to create a range of sugars and sweets. The simple, and obvious, strategy for collecting coconuts is to wait for them to drop on the ground, then pick them up. 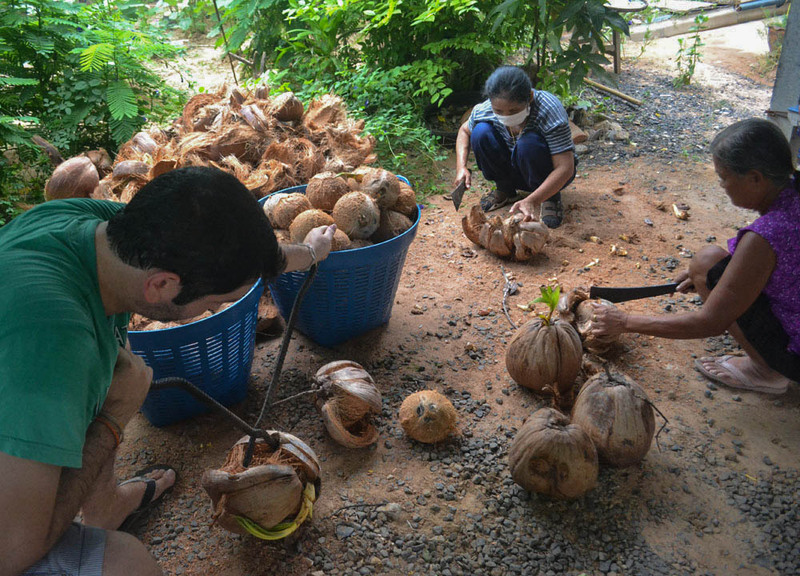 However, with young and less mature coconuts, this process isn’t so simple and the savvy choice would to chop the coconuts at the stem using tall pruning poles. 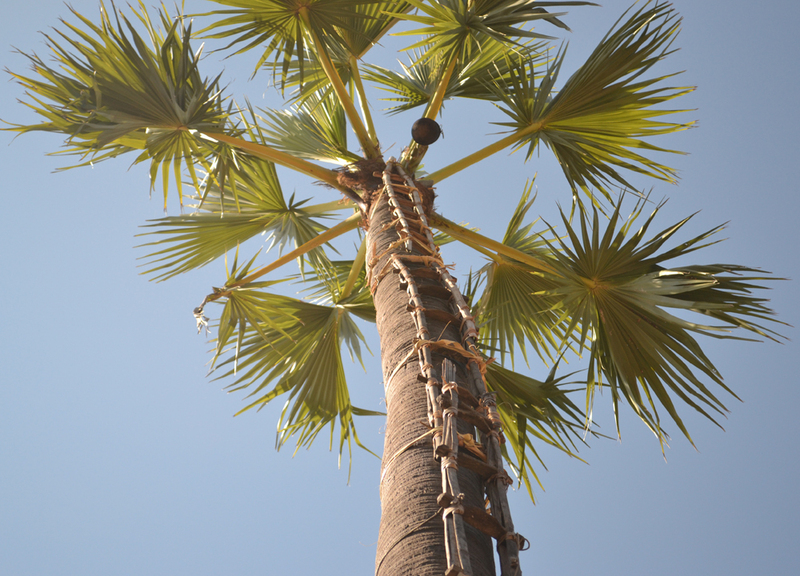 But again, with harder to reach coconuts, the pruning poles won’t always reach and it will be necessary to scale the coconut palms using makeshift bamboo ladders tightly roped to the tops of trees. This same scaling method is necessary when “tapping” palm sap from coconut flowers and toddy pots will be positioned below them to catch the dripping sap. The tapper will return later once the pots have been filled. Also, in the South of Thailand, a common method to collect coconuts is with trained macaque monkeys who climb the trees to throw down the coconuts. Note, death by coconut is a thing, and in parts of Thailand coconut trees will be pruned to avoid injuries from falling nuts. So informative! 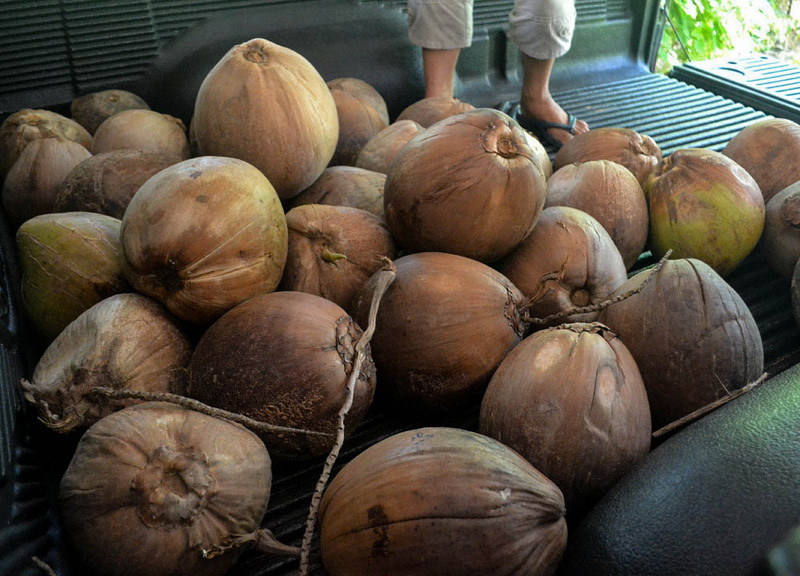 The roasted coconuts are a favorite because the water has this perfumed flavor. More fun in cocktails than the traditional coconut water. I’m an addict. Thanks for taking to write about this plant that doesn’t get enough attention and what’s produced from it does.